Handwriting slows my brain down enough to focus on the analyzation and telling of my thoughts. The deliberate creation of each word through pen strokes, the structuring of each individual sentence, re-reading the previous sentence to ensure continuity and progression of thought from beginning to end. The calculated decision to leave out or include certain ideas or situations; simply because writing by hand tires my wrist – each word must be valuable and so editing is done while writing. Typing gives my brain permission to spill whatever’s going on inside of me without censorship. Little thought is given to whether or not too much information is being depicted in the black Times Roman characters on the laptop screen. All words aren’t created equal and because I sometimes let my fingers go with my brain’s flow, the editing process can sometimes be quite daunting. Everything typed isn’t important and about 35% of it gets highlighted before the “cut” icon in pressed. The only exception to this is when I’m typing a piece on my phone or tablet, which can be as time consuming as handwriting. Does it actually take longer to write an article or story and journey to completion? No. The scales are balanced. Let me explain why. Handwriting a story takes more time than typing one, although the handwritten story takes less time to edit. For example: handwriting a 1,000 word article may take about an hour with another 15 minutes for editing. 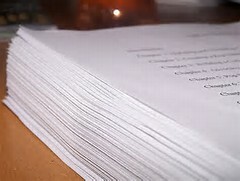 Typing a 1,000 word piece may take 30 minutes and editing takes 50 minutes. The difference is a mere 5 minutes. I journal weekly. I prefer to manually write the entries for the reasons discussed in the first paragraph. Journaling requires introspection and writing by hand allows me to do that. For pieces of flash fiction, essays or short stories, I prefer typing because my fingers can keep up with my brain’s flow. Typing gives me the freedom to write without concern or going off topic; that’s what editing is for – to get rid of what ultimately doesn’t fit with the story. I’d love to read about your preference, manual writing or typing and why, and for what types of writing if you do both. Subscribe to this website and share this article with others. Thanks in advance!